Whatever you think about the chest and biceps, it’s the back muscles that really show how strong you are. They give the classic v-shape that is admired by women on beaches everywhere. Latissimus Dorsi: This is the triangular shaped muscle that goes from your waist to under your shoulders. Highly developed “lats” seem to flare out when seen from the front or from the back. Spinal Erectors:These are the muscles of the lower back. Trapezium: This is the triangular shaped muscle that extends from the neck to between the shoulder blades. Developing the back consists of a variety of movements due to the various muscles of the back and it also consists of heavy weightlifting due to the largeness of the back. Training the back also requires different hand positions on the bar to bring out different areas. Stand with your feet apart, grasp the bar with a medium overhand grip. Bend your knees slightly and look forward while keeping your back straight. With your head up, bring the bar towards your chest, hold and lower slowly to the start position, immediately start your next rep then. Variations include seated cable rows or machine rows. Grasp an over head bar with the palm of your hands facing away from you. While concentrating on the lat muscles pull yourself up until your neck is level with the bar. Slowly lower to the start again. Variations of pull-ups include wide grip pull-ups and pull-ups that you perform so the bar comes up behind your head. Grasp the bar with your palms facing you, pull your self up until your chin touches the bar, slowly lower yourself again to the start. Variations include holding a special bar that allows for your palms to be facing each other when you pull yourself up. These can be performed with a variety of grips which include palms facing you and palms facing away and also special attachments that place your hands in different positions. Hold the bar, position yourself with you knees under the support bar, adjust it according to your needs and pull the bar down towards you, squeeze your back and slowly higher the bar up again. 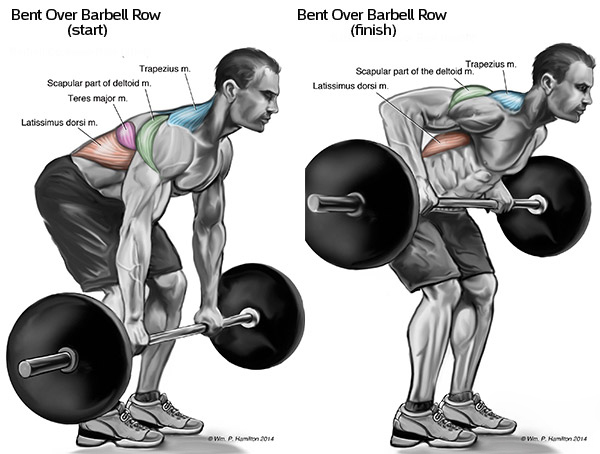 Deadlifts strengthen and build the lower back. CAUTION: Deadlifts can be dangerous if not performed correctly especially while using heavy weights. Build the weight up slowly while using correct form until you can handle heavy weights. Place a barbell in front of you on the floor. Stand with your feet comfortably apart and grasp the bar with an overhand grip. Keep your back straight, look forward, bend your legs down and using your legs initially straighten up until you are standing straight. To lower, bend the knees, look straight ahead and lower the bar keeping your back straight. Hold a dumbbell in one hand, with the other hand hold onto an object, be it a bench, a chair or even your own knee. Variations include one arm cable rows and one arm smith machine rows. Shrugs work the trapezium muscle. Stand up straight, keep a slight bend in your knees and hold a dumbbell in each hand. Without bending your arm use your upper back muscles to “shrug” as high as you can, then lower to the start again. You should look like you are trying to get your shoulders to touch your ears while performing this move.